Choose Bear Woods Supply for the best selection and pricing on fluted dowel pins - available in metric sizes. 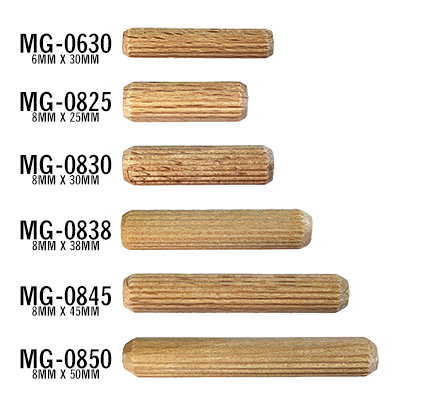 Bear Woods Supply offers Canada's largest selection of multi-groove dowel pins, available at aggressive wholesale prices. 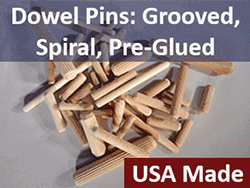 Shop here for deep discounts and quality fluted (aka multi-groove) dowel pins in Metric sizes. 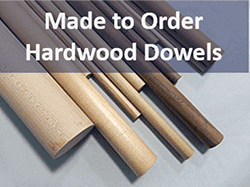 Browse below for sizes - pricing is PER BAG of 100 (unless specified) Metric Dowel Pins. Buy more, save more! Pre-Glued Dowel - just add water to activate the glue - faster and no more mess! Scroll below for in-stock sizes. 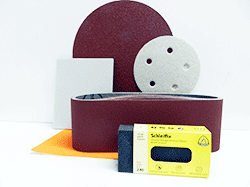 We can provide any size of dowel pin - contact us for sizes not listed.